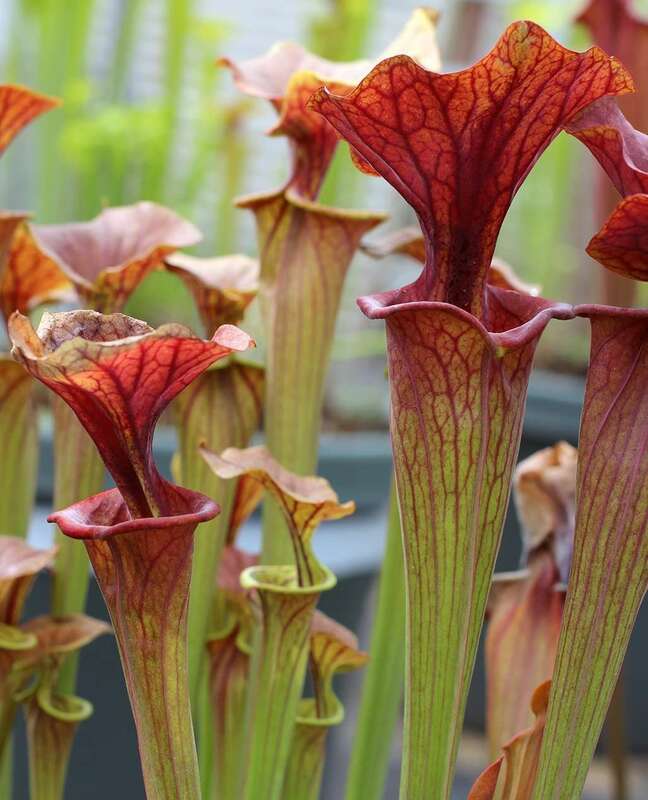 Commonly referred to as the purple pitcher plant, Sarracenia purpurea is arguably the most successful North American pitcher plant. How are we defining success? 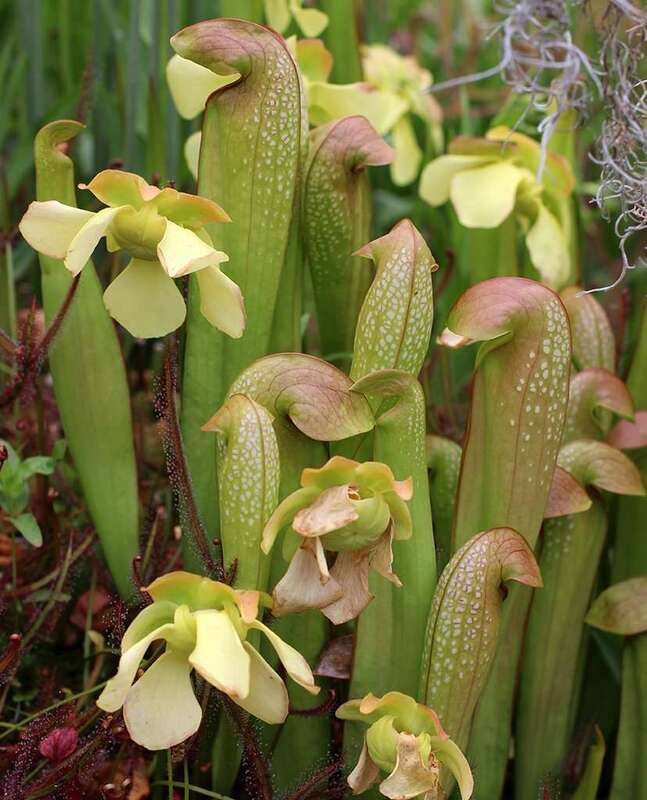 Well, S. purpurea has the widest range of any American pitcher plant, meaning it’s adaptable. Being adaptable and covering a broad geographic area means it’s a survivor, hedging against cataclysmic changes in any one region. Surviving = success. 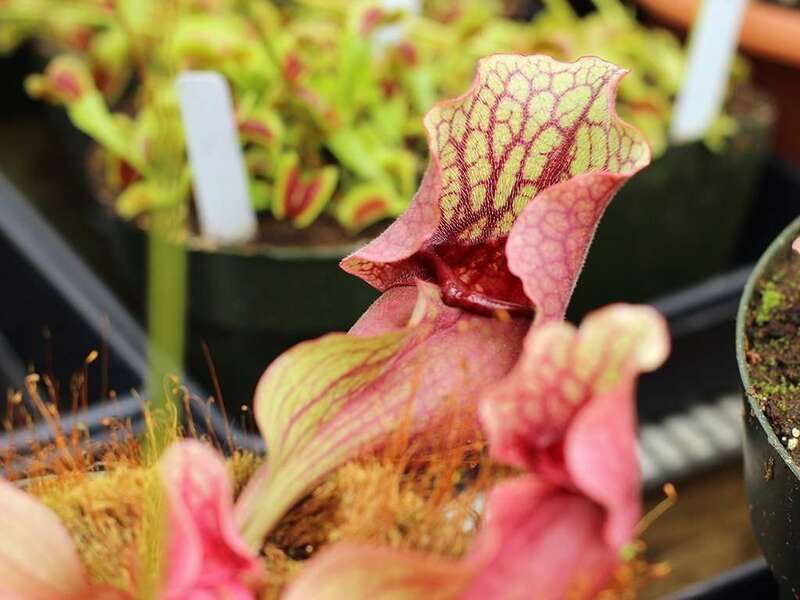 We cover the details of the unique pitchers and digestion process of S. purpurea below, but know that the pitchers are squat, adapted to collect, rather than shun, rainwater, and foster symbiotic relationships with microorganisms to assist in the digestive process. 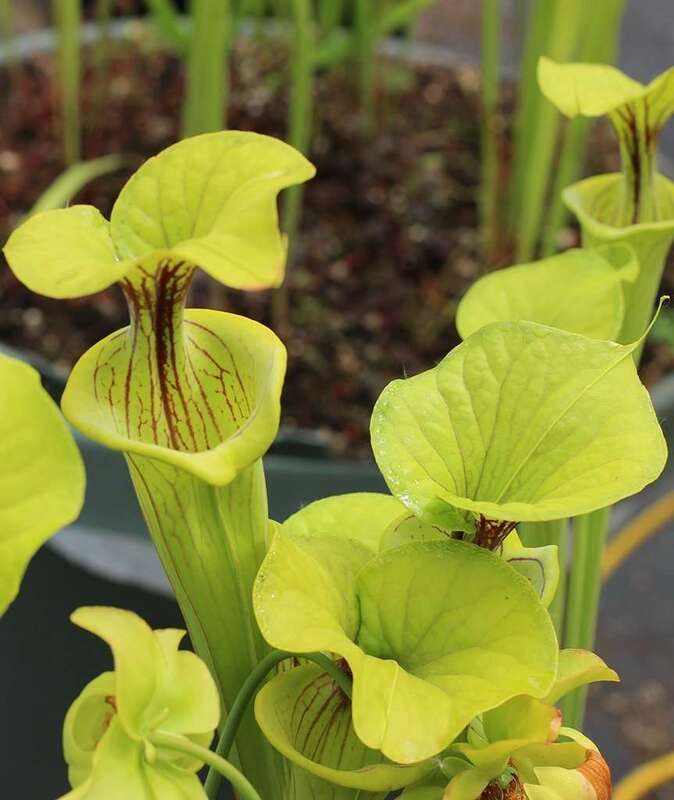 It’s a super fascinating plant that leverages its environment in unique ways to handle the heavy lifting of nutrient capture. 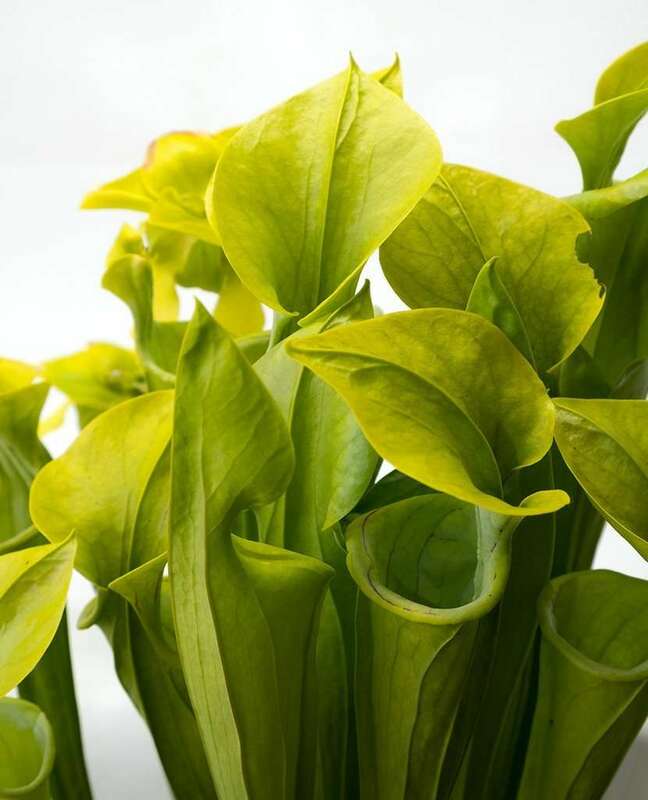 S. purpurea is divided into two subspecies, Sarracenia purpurea ssp. 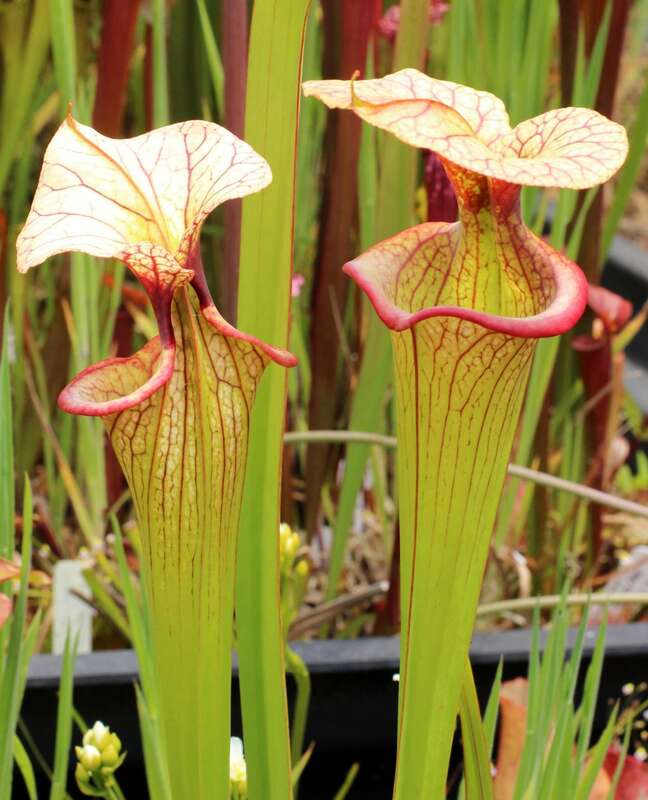 purpurea and Sarracenia purpurea ssp. venosa, the former found in northern regions, and the latter in southern regions. 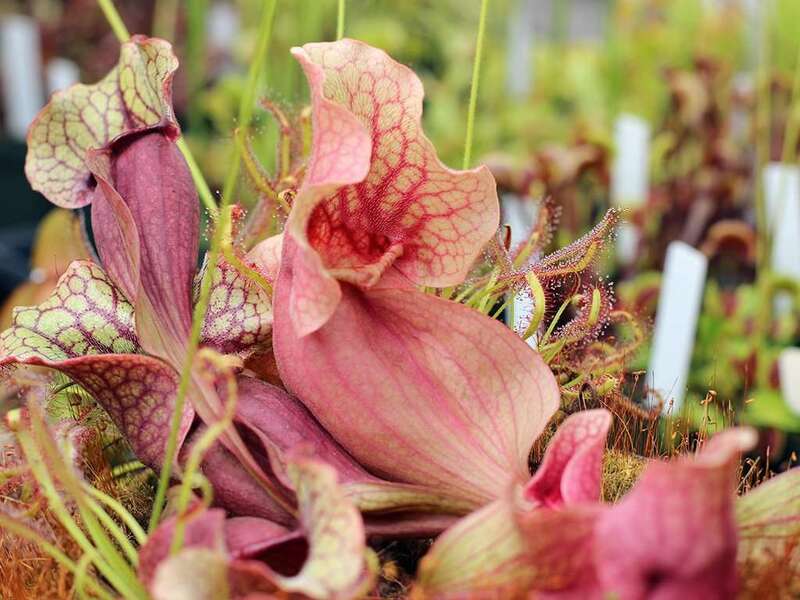 More on our purpurea subspecies, below. No digestive juices?! 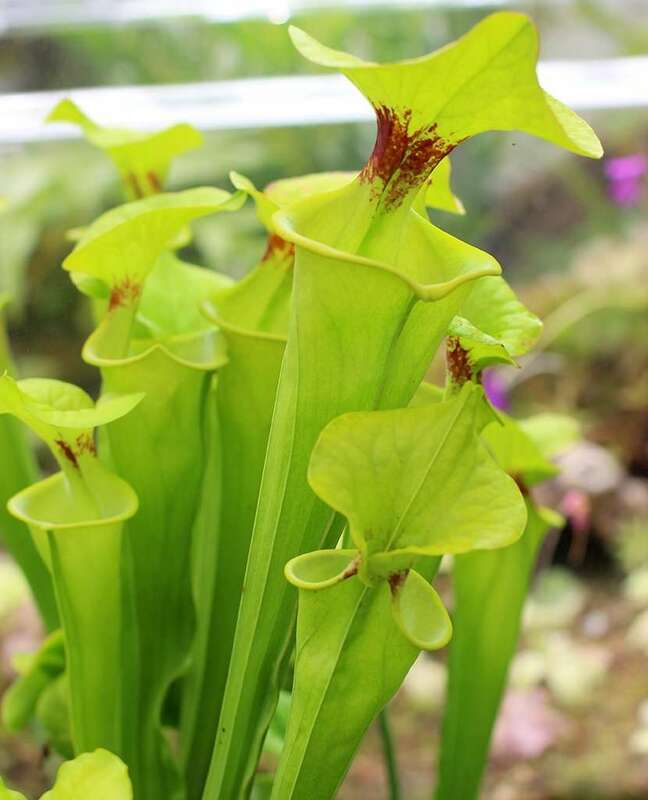 Pray tell, how does Sarracenia purpurea practice carnivory without the ability to dissolve soft tissues of captured prey? Great question. 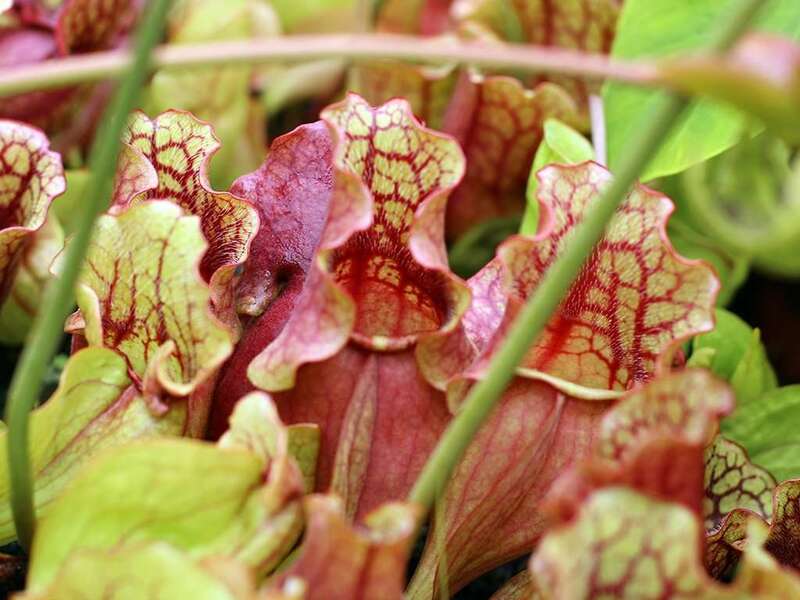 The leaves of S. purpurea collect rainwater. 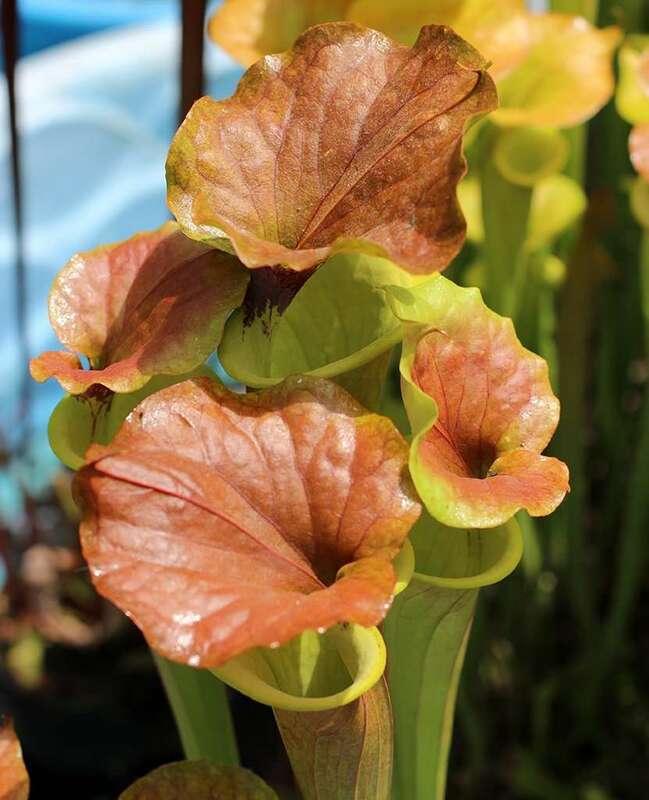 Without digestive enzymes, water-filled pitchers play friendly host to numerous microorganisms that aid in the digestion process. Mosquito larva, bacteria, and even tadpoles will eat prey that falls in and drowns. Out the opposite end of these symbiotic critters comes poop, rich in nitrogen, potassium, and phosphorous. 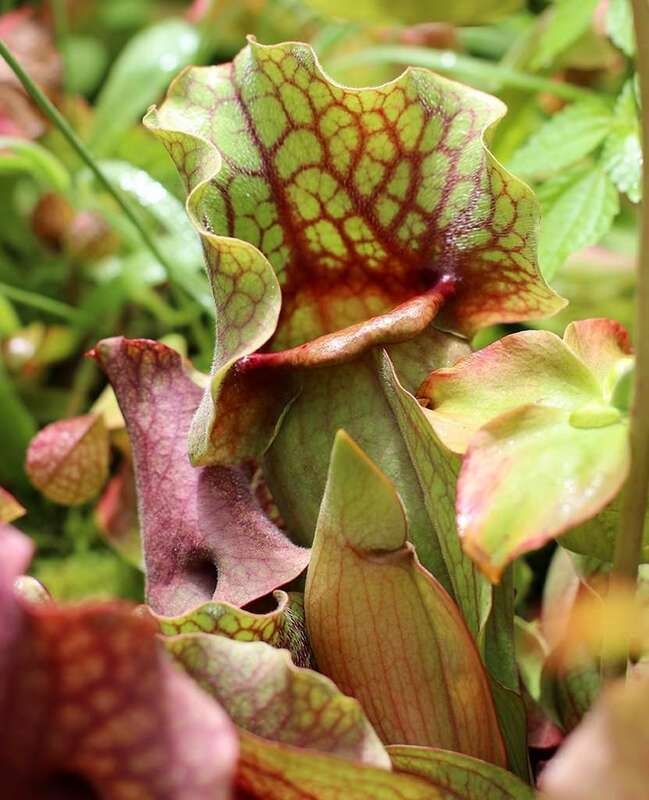 S. purpurea doesn’t have the ability to digest prey, but pre-digested prey can be absorbed. 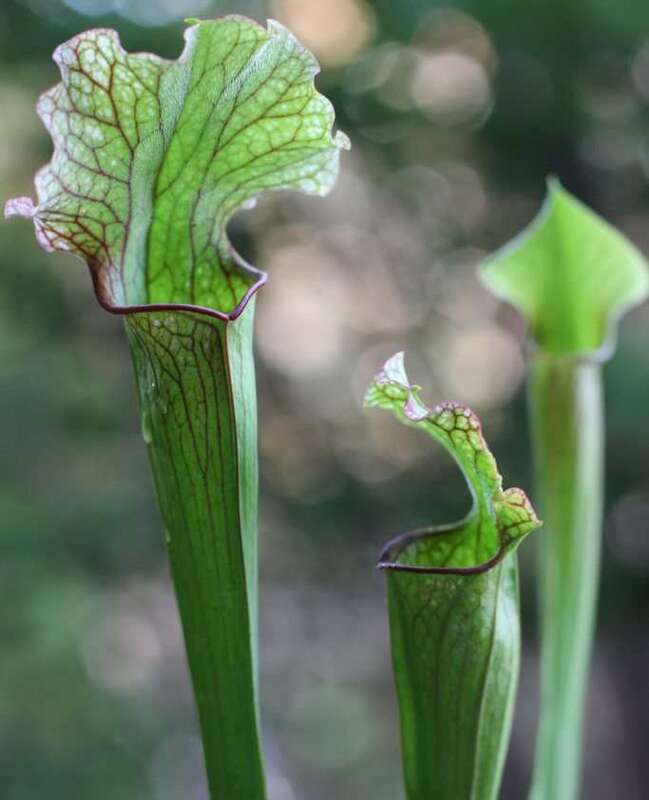 There are also theories that the skyward-pointing open mouths of the pitchers evolved to catch leaf debris falling from taller plants and trees. This debris is broken down by the microorganisms within pitchers, and becomes a kind-of compost tea that S. purpurea then absorbs. 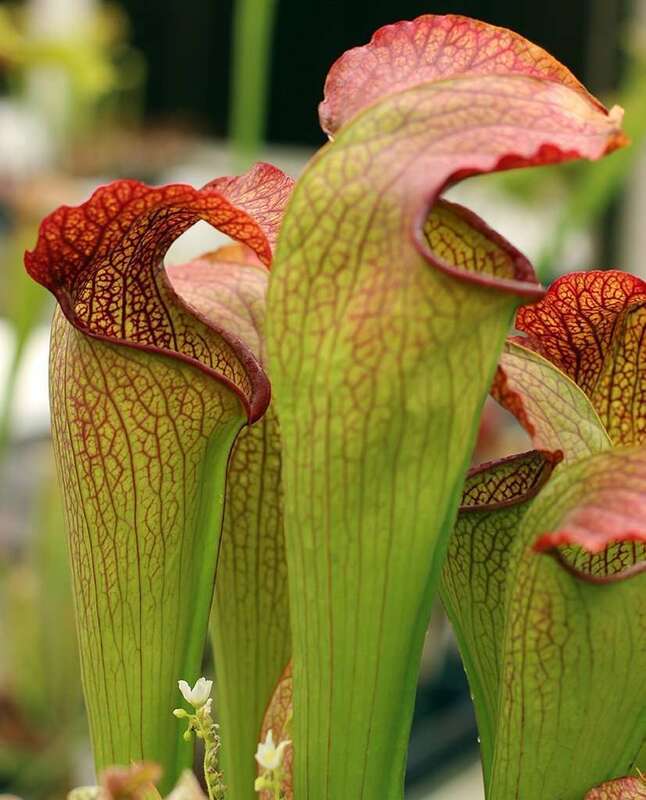 Speaking of pitchers, they grow in a rosette pattern, staying squat against the ground. 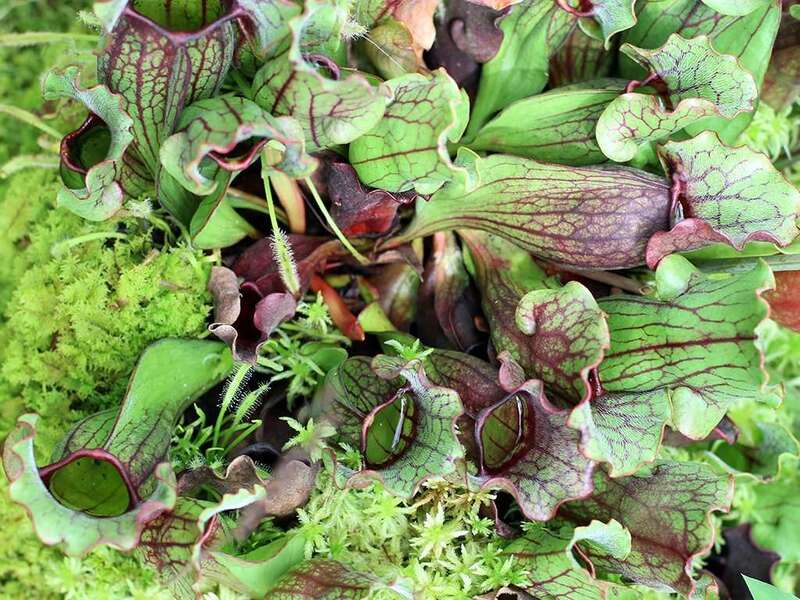 At 6 to 8 inches, they aren’t the largest North American pitcher plants, but colorful venation and fancy ruffled lids do their part to attract prey. 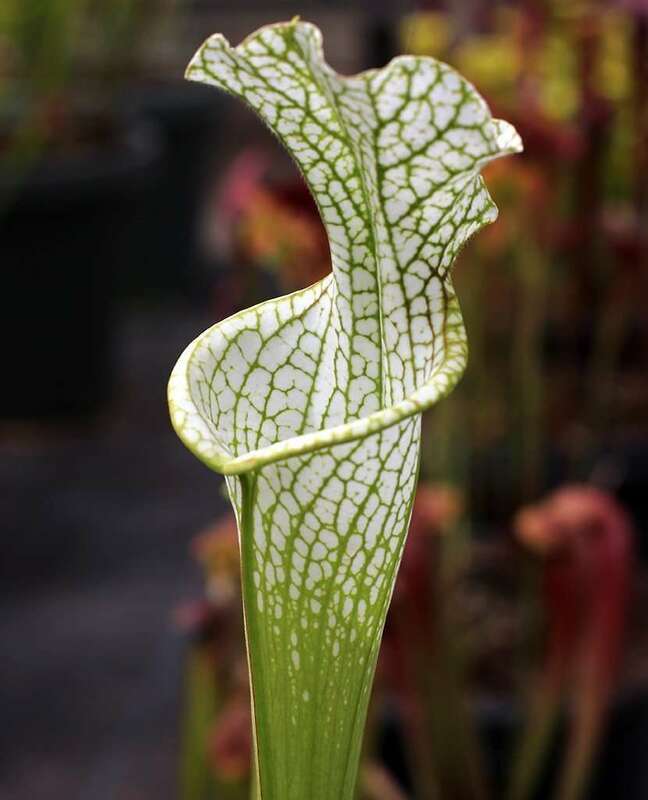 Like other Sarracenia, the lid is densely packed with downward-facing hairs to guide insects towards the open mouth. 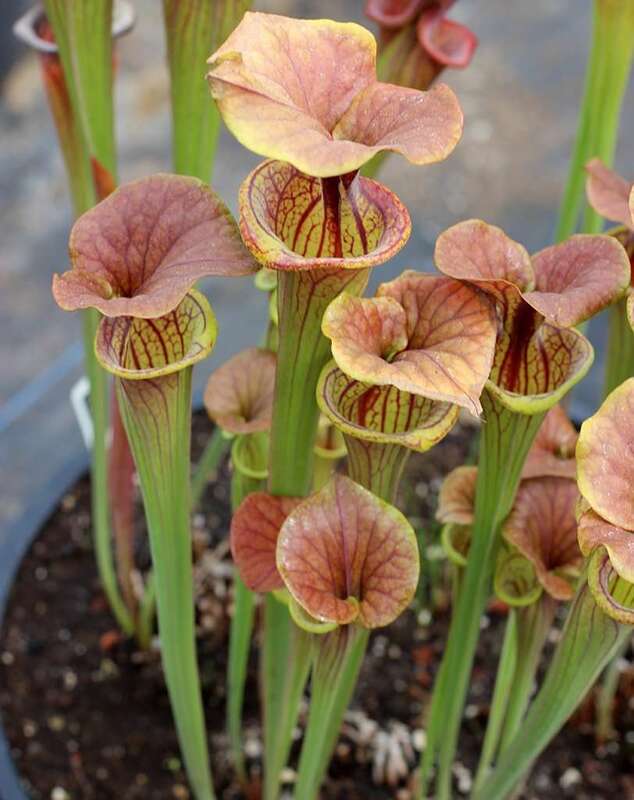 These hairs tend to be thicker and longer than on most other Sarracenia. 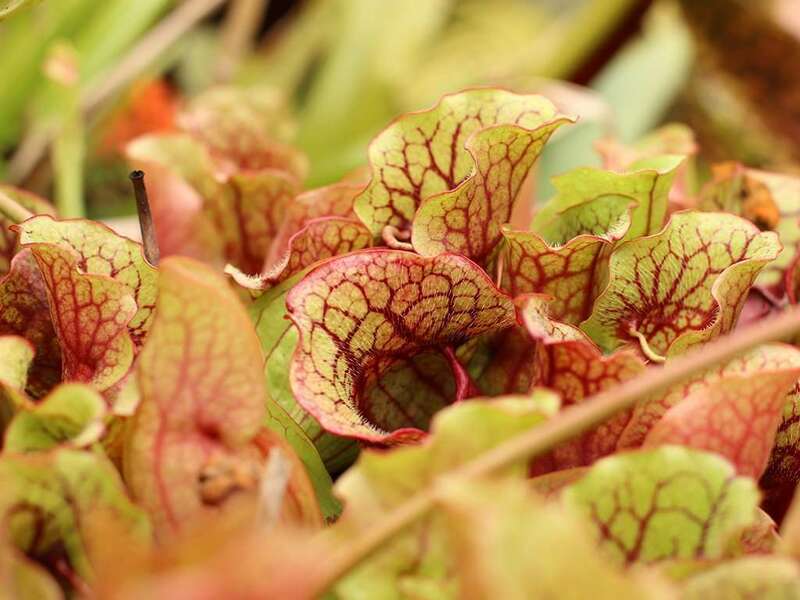 Frequently called the northern pitcher plant, this purpurea subspecies grows throughout the Great Lakes region and the eastern seaboard from New Jersey up through Labrador, Canada. Introduction and naturalization in northern California through Washington State, New Zealand, and parts of Europe has been successful – almost too successful as it’s seen as an invasive species in some areas. 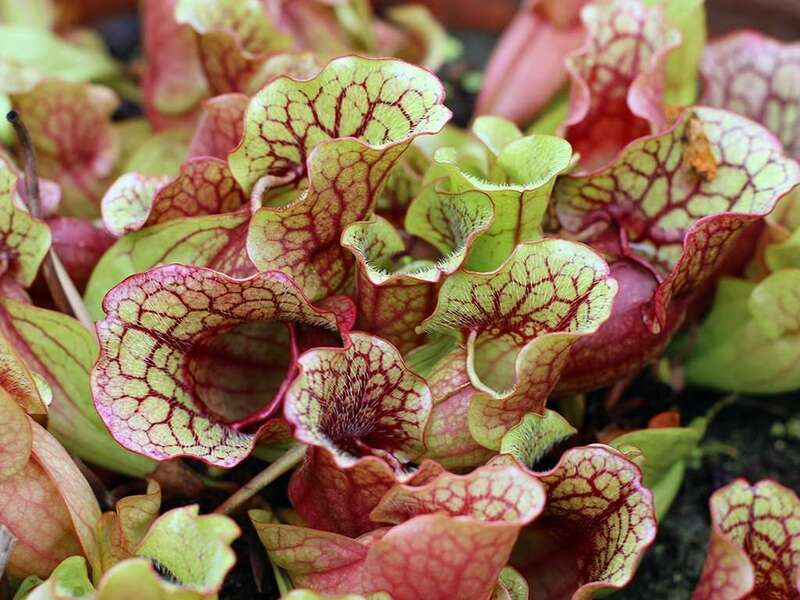 Pitchers on the northern purpurea pitcher plant are more numerous, narrower, and more densely packed than it’s southern counterpart. Flowers are red-purple and bloom midsummer. Found to the south, this subspecies meets its northern sister in New Jersey, continues along the coastal plain to Georgia, and heads west through the Florida Panhandle, southern Alabama, and Mississippi. You’ll often find intermediate hybrids of purpurea ssp. 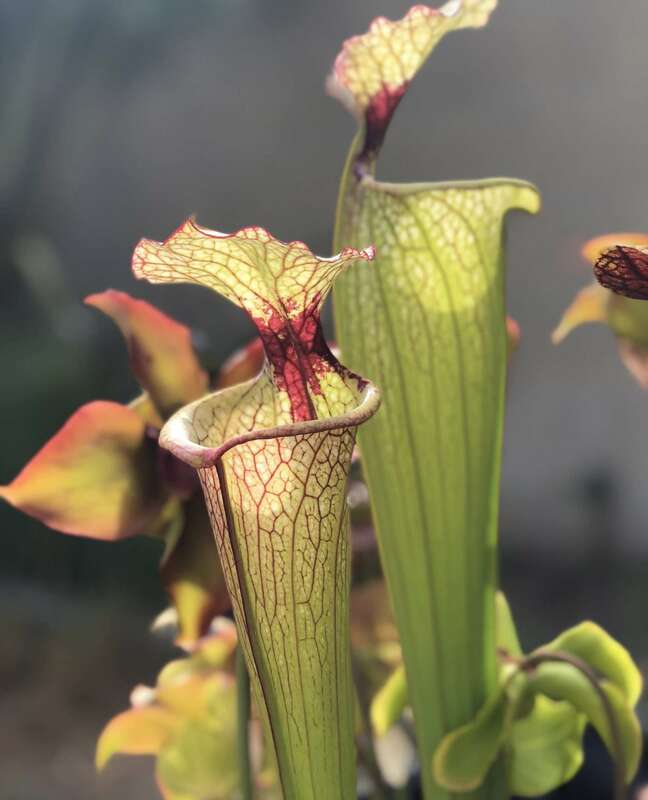 venosa and purpurea ssp. purpurea in the New Jersey Pine Barrens where the subspecies meet.